Future journaling is a type of reflective journaling that is used to ground ourselves in what we can do in the present, to assist ourselves in the future. The writing activity itself is used to control momentary anxiety, doubts, and fears about our present condition, and remind ourselves of our bigger picture goals and values. The writing produced will become a tool in the future to refer to when we feel particularly lost. Our present selves are horrible judgements of our reality and the extremity of our anxieties. Trust not your mind right now, but your judgement in the future to guide yourself. Why are really old people so calm? 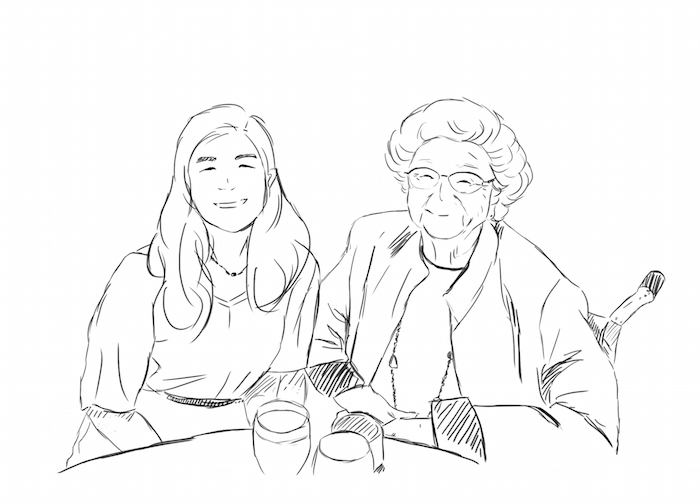 I recently had the incredible opportunity to have dinner with a 98 year old woman, who was telling me a story about how she was going to college when WWII was happening. The thought of it seemed incredible to me, and I could not possibly fathom how she could relate the experiences of WWII with her life today. As my jaw dropped, she smiled politely, and talked about the event as if it were any other weekend at home. She was such a peaceful woman, who seemed to not have a care in the world. Her mind sharp and clear, she had the assuredness of someone with wisdom. That night before we said our goodbyes to each other, she held both my hands and smiled, and I suddenly felt incredibly safe. As I thought about her peace and stability, I wondered what it was like to live so long. What worries and thoughts would consume me when I’m at that age? Will I have any regrets about my life? What would I have accomplished by then? When I returned home that night, I decided it was a good moment to practice one of my periodic rituals, which is future journaling. I usually save future journaling when I’m particularly anxious or worried about something relatively small, but the moment of realization I received from that woman made me want to write. In my entry, I wrote a letter to my 100 year old self, and ask her a bunch of questions, my concerns, what I accomplished, how I felt, and if I felt that I have fulfilled my role in life, whatever I chose that to be. Future journaling is a type of journaling addressed to your future self. I like to format mine as a letter directed to myself in the future, whether that be a week or month or year or 20 years into the future, but format isn’t important. What is key to effective future journaling is framing your current worries and what you don’t know, to the relative value of your entire lifespan. This practice helps you to focus on your true goals and values in life, so you don’t get caught up in the minuscule problems of daily life. While minor stresses are minor, because our present selves are horrible judgements of our reality and the extremity of our anxieties, trust not your mind right now, but your judgement in the future to guide yourself. We tend to get caught up in small things like the fact that we were criticized by our boss, we dented the car, we didn’t get invited to a certain party, or we got a poor score on a test. These details, while unpleasant, are miniscule in the grand scheme of things, and frankly don’t really matter. But our current selves have a hard time judging actual value, so to prevent ourselves from magnifying their negativity, we can future journal to tangibly tie these experiences to the grand scheme of our lives. Pick a nice, quality, journal to write in. I like to take my four-year-journal, and keep my future journaling entries at the beginning of every month. I leave blank pages in-between months so when I feel I need to future journal, I can flip to these empty spaces and write, so I can feel less anxious about what’s bothering me in the moment. Depending on the issue bothering you, choose a time frame to write to yourself. This could be in a week, a month, a year, a certain age, or past a certain event. Imagine yourself at this future moment, and what the ideal version of you would look like then. How do they think? Feel? What have they accomplished? How did they move past this detail you’re struggling with now, to succeed? Once you have a vision of what you could be like, then start writing to them. Ask them questions, share with them your current worries and how you’re going to overcome them so they can be the best future version of themselves. Through the writing process, focus on the value of the problem you’re facing currently, and whether it matters in the long run or not. Think about what you want, why you care, and why it’s going to be alright anyways even if things don’t go perfectly as planned. Future journaling is the most therapeutic form of journaling out of the three, and consequently the benefit from it can feel a lot more abstract. Rather than a daily discipline, future journaling requires a deeper mindfulness than flow or chronicle journaling requires, and you must get in touch with your core values and vision of fulfillment to successfully attain the benefits. This form of deep mindfulness is used to strive for understanding of ourselves, our values, and re-recognize the relative value of the things that happen to us. While the writing activity is therapeutic in it itself because it will help to bring our present anxieties and worries to a halt, the writing produced will also become a tool in the future to check whether we’re on the correct trajectory for fulfillment, especially for times when we may feel particularly lost.